INTERVIEW – Kameron is from one of the dozen Kakai villages liberated by the Peshmerga in May 2016. When he went back to check on his home, he discovered that the area had been completely mined. Eleven members of the community have already been killed by landmines. How did the Kakai villagers flee when ISIS arrived? Kameron: On August 7, 2014, we woke up with a start at 2am. 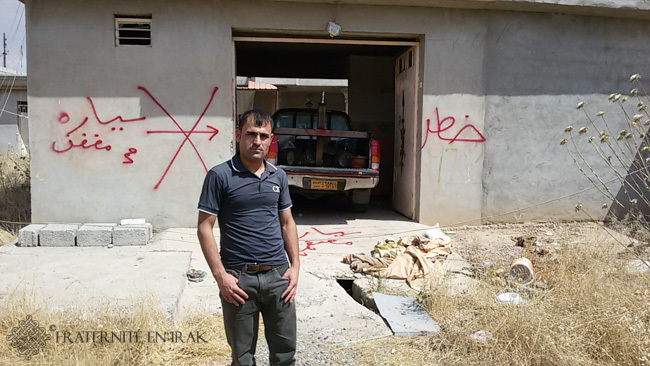 Our brothers and cousins who worked for the Peshmerga had come to tell us to leave our houses as soon as possible. They were on the front line and they had seen how close the danger was: ISIS was coming. We woke the children up in the middle of the night, took some important belongings and left. My son and my nephews were crying, like all other children: they didn’t understand anything, they were awake in their sleep, and we had to leave immediately. I took what I had in gold, silver, and my ID documents, and I left in my car with my family. We offered to take those who didn’t have a car. There was true solidarity that night. In the chaos, some people didn’t think of taking their important belongings: they left everything there, money, papers, etc. There were tears, haste, confusion, but we all made sure no one got left behind. Most of the people who fled on that day didn’t really understand what was happening. How did life carry on after this terrible night? We took refuge in the neighboring villages, behind the front line, mainly in the city of Kalak and its surroundings. The Kakai people started to look for new jobs. As far as I’m concerned, I’m a security guard in Kalak. We kept on living. I stayed with my family near Kalak, in a house where all generations lived together: grandparents, children, and grandchildren. We built this house recently, to be more comfortable. The Kakai people have faith in their future, they continue to hope until the liberation. When the Kakai villages were liberated, two years after the flight, how did the Kakai community react? The three red flags indicate three mines. A fourth one exploded. 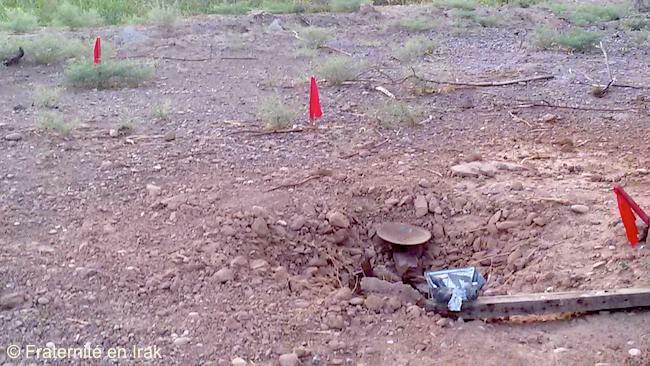 Can you tell us a bit more about the landmines left by ISIS? Eleven members of our community died while returning to their homes. Despite the four casualties on the first day, a few men kept going back to check on the situation. In the following days, seven others died. These people had turned themselves into amateur mine-clearing experts, accepting large sums of money in return. They were not trained in mine-clearing and their fate was awful. We were traumatized by these events, and the entire community grieved with the victims’ families. The Peshmerga forces took over and tried to remove the mines from the villages. Three of them died the same way. After these tragedies, they refused to carry on mine-clearing operations. It is obviously understandable. After eleven deaths and five wounded people because of landmines, no one wanted to go back to the villages. Yet, the Kakai want to go home. That’s why the mine-clearing operation launched by your association is vital to our community. We are so close to being home! And since the community and the Peshmerga don’t want to take part in this operation, because of the heavy losses they suffered already, it is necessary that an international organization composed of trained experts come to our help. They will then be able to train us to carry on mine-clearing efforts. But it’s clear that we can’t succeed by ourselves: the trauma has been too hard on us. You went back to your place: can you tell us more about some of the liberated villages? Yes, I went back to my village on May 30, 2016 to see what was left of it. 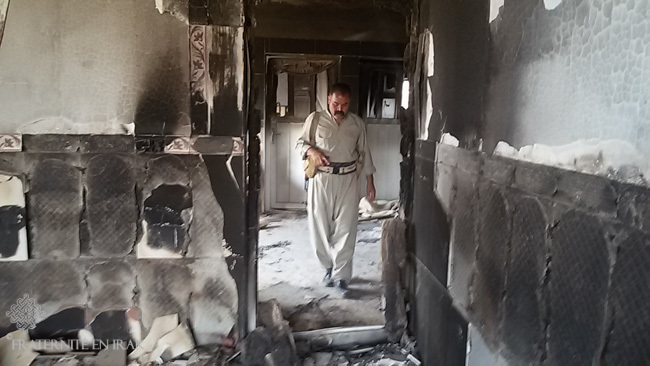 The first floor of my house was burnt by ISIS fighters. There’s nothing left. The houses were damaged, some were burnt, sacked or demolished; and the grass is growing inside because they were uninhabited for months. Doors had been pierced randomly in walls to allow ISIS fighters to move quickly from one house to another. Our temple was destroyed as well. Do Kakai people want to go back to their liberated villages? Yes, and although some want to move somewhere else permanently, most want to go back. Even the people who found a job in Kalak can’t wait to go home. My uncle, for example, would like to go back to his house; but he was shocked by the mine explosions. Opening the fridge door, stepping on a piece of wood, a soda can, picking up a piece of paper… those are all simple movements that can trigger an explosion and kill you. As soon as we’re told that mine-clearing experts are here and that the fields are safe, the vast majority of inhabitants will go back home. A second issue is power. For now, there is no power because the generators were fueled by the city of Mossul, which is still occupied by ISIS. The city of Kalak has promised us that if more than 50 families resettled in their villages, it would connect them to power. It won’t be hard to find 50 families, so I think it won’t be a problem. The main issue today is the mine-clearing and getting the Kakai people to feel safe again, after the trauma they experienced with the mine explosions. Fraternity in Iraq has launched a mine-clearing operation in the Christian and Kakai villages of the Niniveh plain, including Kameron’s. Without mine-clearing there can’t be any reconstruction… Help these populations resettle in their homes! ← Emergency for mine clearance of the Nineveh plain!